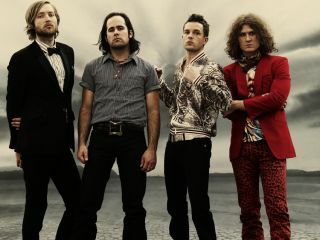 With Day & Age, The Killers are about to release one of the best albums of 2008. And as if to to celebrate, the Las Vegas-based band played several of their new songs during a triumphant concert last night (3 November) at London's Royal Albert Hall. Most groups can't even envision, let alone pull off, combinging the epic, emotional vistas of Bruce Spingsteen with the detached, cool aesthetics of New Order, but with songs such as Sam's Town and When You Were Young, The Killers have digested both elements completely and distill them into a style that is uniquely their own. It's there in the faux fairy lights and neon palm trees thatadorn the stage as the band perform the new, ultra-hummable single Human. Vistas of sound and vision, real and unreal - that's The Killers' world, and one can't resist being sucked in..
During a set that placed no emphasis on any single album, The Killers mixed things up effectively, ending the main show with a rousing take of their smash, Mr. Brightside. Returning to the stage for an encore, the band practically shape-shifted during a moody, dramatic rendering of Neon Tiger, a complex and bewitching track off of Day & Age. But then it was back to slamming, as pounding readings of When You Were Young and All The Things That I've Done concluded the show. And just like that, a stadium band is born. In the coming weeks, look for an exclusive podcast interview with Killers' guitarist Dave Keuning on MusicRadar.